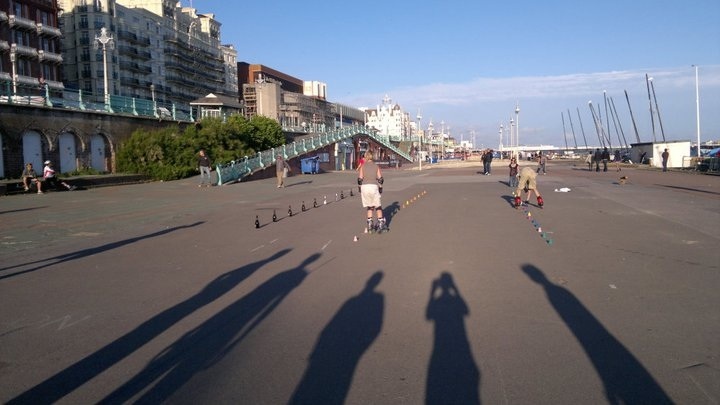 This summer skate date with all my friends in Brighton is now the highlight of my skate year. 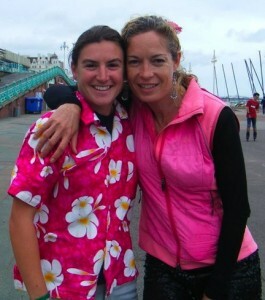 I remember when I lived in London and a trip to Brighton to see my best friend Eve seemed like allot of effort. 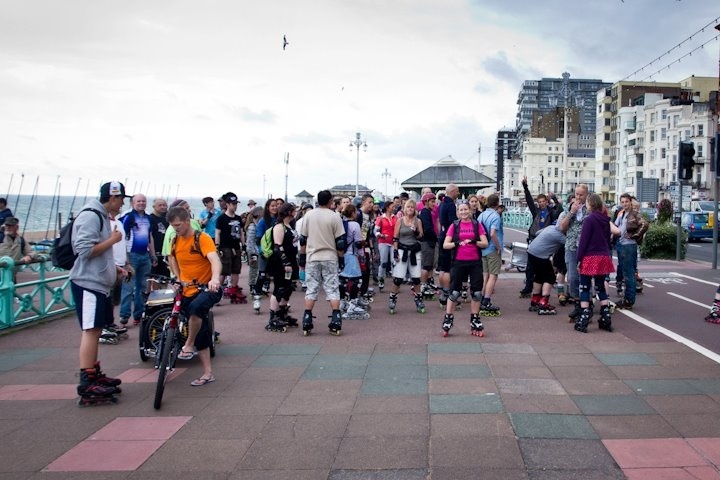 So when so many people make that effort and come to Brighton for a day of skating, I feel honoured and blessed and deeply happy. It wasn’t boiling like previous years but personally I skated more because the temperature was more conducive. My day started with Matt and Jo from Skatefresh and I teaching three different groups simultaneously on the skate area at the West Pier. No passing traffic like Hyde Park not even another skater or skate boarder to interrupt our lesson flows. It is so rare to find ‘space’ just dedicated to lessons. Made me happy to see Skatefresh operating like that. After our lessons people started arriving with smiles, hugs and eagerness to skate. I spent the day watching my students from both London and Brighton skating together and with a variety of London skate scene friends and regulars. It is always a joy to see your friends mixing and having their own fun that doesn’t need you to sustain it. 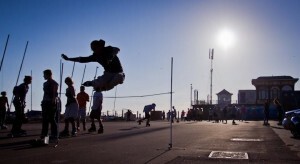 It was great to see the West Pier transformed into a skaters’ paradise, with various slalom lines (including the return of the Champagne Bottle Slalom), CJ’s high jump which kept me enthralled and hollering like a football fan at a winning goal, and plenty of space for twirling, dancing, jumping over walls of cups, joining a Thumper Conga, and then plain old skating. We were treated to a gorgeous wheat-free, beetroot and chocolate cake made by my student Kristin and her gorgeous kids. A wall of broad shouldered skater guys who didn’t mind burning their fingers was created to enable the lighting of candles in some Brighton wind. The round cake did the rounds and was appreciated by all and consumed in its fullness. The drops of rain that fell never made the ground totally wet (which is my definition of ‘wet) but even so, when the second showers started I had had enough and made a pact with the universe and weather Gods that if I distracted everyone with a lesson on how to moonwalk it could then sort itself out and be better weather. I was again impressed by everyone’s attempts and polishing of their moonwalks, such a great move. And sure enough the weather changed and as we set off for the street skate I knew the worst had passed. 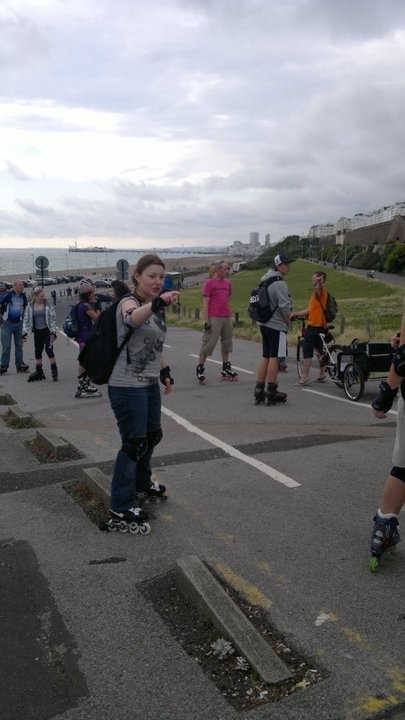 The street skate along the seafront to the Marina and back to Hove and back was beautiful. The bicycles were friendly and very few in number and pedestrians impressed and amazed at so many skaters and our mobile music systems. The Thumpers are still a thing of beauty for me and wearing an Asbox continues to be one of my favourite things. Feeling music pounding from the Asbox and hitting the back of my chest and letting that propel your skating is a wonderful feeling. I loved watching my yoga teachers take to skating like ducks to water and even going on the street skate having not skated since childhood and putting blades on 20 minutes before the skate started. As we arrived back from the street skate the sky was clear and the sun came out. 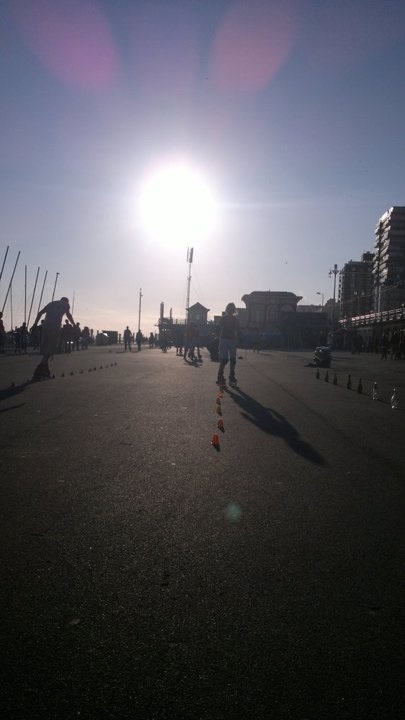 It was one of the most beautiful ‘sun coming out’ moments and brought smiles, lightness, long shadows and a glorious early evening of skating for everyone. It was the most wonderful end to a fabulous day. It went too quickly and I would love to have one every 2 months (now there’s an idea), but I am left with a warm and grateful feeling. I have been so fortunate to have this job that I love and to have clients who value my attention to detail and keep me outdoors earning my wares. I am a different person to the lost, office bound Asha of 12 years ago and I am deeply grateful to anyone who shares any part of my story. 2 Responses to "Happy 12th Birthday!"